U.S. District Court Judge Martin Feldman, who overturned the Obama moratorium on drilling in over 500 feet of water in the Gulf, now has to have federal marshalls protect him because of death threats against him. Watch the video of a pro-illegal immigration proponent literally threatening a racist murder spree against white people. It doesn’t matter if virtually all the actual violent acts and threats of violent acts are coming from the left. It’s all the tea party’s fault. It doesn’t matter that the Demagogue-in-Chief has cynically refused to do his constitutionally-mandated duty protecting Arizona in favor of holding border security hostage to his Marxist political agenda. It doesn’t matter that Phoenix, Arizona is the world’s second worst cities for kidnappings in the entire world behind only Mexico City. Mexican drug cartels have set up shop on American soil, maintaining lookout bases in strategic locations in the hills of southern Arizona from which their scouts can monitor every move made by law enforcement officials, federal agents tell Fox News. The scouts are supplied by drivers who bring them food, water, batteries for radios — all the items they need to stay in the wilderness for a long time. Click here for more on this story from Adam Housley. It doesn’t matter that even the federal government is warning that large swaths of Arizona are now off-limits because Mexican drug gangs have overrun it. 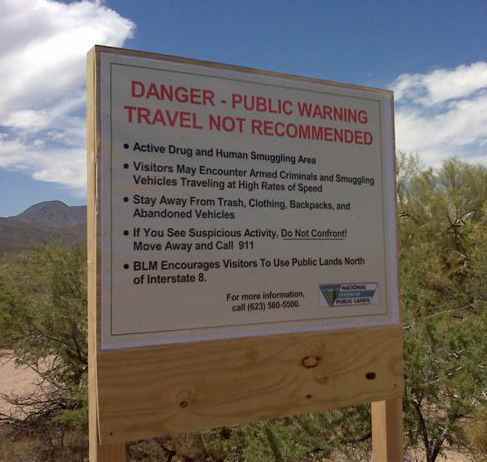 It doesn’t matter that Arizona is so overrun with criminal illegals that the federal government is putting up more and more warning signs telling American citizens that they are not safe to enter their own country. A Mexican drug cartel has threatened police officers in Arizona who confiscated a marijuana shipment, prompting the small town department to warn its officers to remain armed and have radios with them at all times, and keep their body armor handy. Police and experts believe the warning against the Nogales, Ariz., cops marks the first time that powerful Mexican drug cartels, used to bribing and bullying police south of the border, have targeted U.S. officers. It doesn’t matter if Arizona police officers are already being gunned down by AK-47-wielding drug gangs. It doesn’t matter that an outgunned Arizona police force are literally begging for help. It doesn’t matter that out-of-control mobs of illegal immigrants and Hispanic supporters of illegal immigration have even attacked the police. The simple fact of the matter is that the federal law is FAR “harsher” or “more racist” than the Arizona law (see also here for a more detailed analysis). The Supreme Court has ruled unanimously (that means even Ruth Bader Ginsburg voted for it!) in the 2005 Mueller v. Mena case that the federal authorities have the right to demand citizenship status at any time for any reason without the need to demonstrate reasonable suspicion [Muehler v. Mena, 544 U.S. 93 (2005) (“the officers did not need reasonable suspicion to ask Mena for her . . . immigration status.”)]. The Arizona law is actually FAR more restrictive than the current federal law that the Obama White House WILL NOT ENFORCE. And the Arizona law is completely constitutional for that reason. The left has demonized, demagogued, and most certainly flat-out lied about the Arizona law. It doesn’t matter that the leftist whackjobs – including the leftist whackjobs in the Obama administration who are going to attack Arizona – have not even bothered to read the law that they’re demonizing. Obama is suing Arizona for a law that is no different from the federal law, while ignoring all the “sanctuary cities” that have been in total violation of the federal law. It doesn’t matter that the violence in Mexico that is clearly coming here is so out-of-control in Mexico itself that the man expected to win election as the next governor in the Mexican state of Tamaulipas was just gunned down and murdered. None of that matters to the despicable left. The Democrat Party demands that nothing be done at all to stop illegal immigration because they believe they can use the issue to demagogue their way to winning the Hispanic vote. The Democrat Party demands that Arizona not be allowed to do anything whatsoever to protect themselves. It doesn’t matter that the Democrat Party and the mainstream media that writes their propaganda are officially hypocritical, demagogic, and yes, frankly both evil and treasonous as well. We are becoming an out-of-control society on the verge of collapse, and we need to purge ourselves of Democrats as much as we need to purge illegal immigrants.